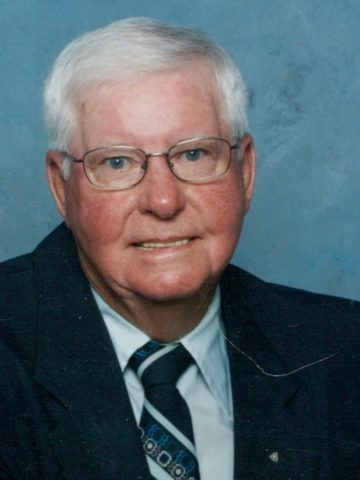 John Carden “J.C.” Escue, 94, passed away at his home Saturday, April 13, 2019. Born November 10, 1924 in White House, TN, J.C. was the son of the late George Escue and Roselia Baggett Escue. He was also preceded in death by his first wife, Ellen Harris Escue; a son, Johnny Harris Escue; and his siblings, Alvin Escue, George Escue and Patty May Escue. J.C.was retried from Tennessee Kentucky Sprinkler Co. and was well known as a staunch supporter and benefactor of the White House community especially White House Heritage High School. He loved sports and supported the football team, donated field lights and the concession stand. He was also an avid UT fan. He also enjoyed making furniture, fishing and working in his “garden” which was something he liked to share with others. J.C. was an active member of the 1st Baptist Church of White House. He was a member and past master of Burton Lodge #272 of Masons. J.C. is survived by his wife, Jacqueline Caner Nash Escue; two daughters, Sandra C. (Rodger) Gooch and Linda (Ronnie) Lashley; 9 grandchildren, Leigh (David) Newsome, Jimmy (Angie) Gooch, Kara (Jason) McMullen, Dana Lashley, Jason Lashley, Nickie (Stoy) Baldwin, Brandon (Katherine) Escue, Julie (Bill) Norfleet and Randy (Denise) Phillips; his daughter-in-law, Cecelia Escue; 21 great-grandchildren and 13 great-great-grandchildren. A celebration of life service will be held Wednesday at 2 PM at Cole & Garrett Funeral Home White House. Visitation will be Tuesday from 2 to 7 PM and Wednesday from 12 to 2 PM. A masonic evergreen service will be held Wednesday at 1:30 PM. What a wonderful man. So very special to me. He will be missed by all who knew his kindness and his laughter. Everybody loved JC. He will be missed. How sad to loose, yet another from a MOST wonderful generation! My family and I go waaaaaaaaaaaaay back with the Escue family – wonderful, fun memories. May God bless all of ya’ll at this time and the days ahead. Our prayers are with you. Mr JC always had a smile. A true friend to all. He made White House a better place. He will be missed. James and I loved Mr. JC. He always had a smile on his face and kind words to say. Prayers for his family. He will be greatly missed. To all the Escues. I am so sad that JC has passed on. We will miss his warm loving kindness, his humor and generosity – just to name a few things. JC could make or fix anything and did so for all his 94 years. His faith was steadfast. I remember he allowed the youth at his church to dye his hair purple when they achieved a goal they had set. He was steadfast in his love of family, taking care of his wife, Ellen Louise, when she developed an illness that has affected our family through several generations. He was very proud of being able to work with the county to help get the beautiful school built across the road on some of his land. His love for God, his children, grandchildren, and great grandchildren was always apparent. Fifteen years ago we welcomed Jacque when he brought her into our lives.. I was proud to have you as my brother in law and grieve for our loss, but know you are with with the Lord and probably discussing how to fix tractors, grow vegetables and make molasses. I love and miss you. Sincerest condolences to the family of Mr J C , a man I admired and respected . I have known Jake all my life. He worked with my dad (James Edward Jones) and late husband (Joe Kelly). He was one of the most loving , caring people I have ever known. Everyone that knew him loved and admired him, he will be sadly missed by everyone. Love to Jackie , Sandra and Linda. So sorry for your loss. My thoughts and prayers go with you during this time and for the days ahead. To the family of one of the most kind-hearted, sweetest men I have ever known. What I loved the most about J C was his smile and sense of humor. He always greeted you with a sincere hug and you couldn’t help but love him. I thought a lot of him and his family, My thoughts and prayers go out to them during this most difficult time. Many thanks for his contributions. White House has lost a great member of our community! He will be missed!